The felted flower at the top is made from the pilling and fuzz balls that appear on hand-knitted garments after they have been worn a while… I thought I could make a good use of them, by turning them into flowers! (I’m planning on making Christmas Decorations with them too). Although they have been sitting in his drawer for a while, He has started wearing them today… They are great inside wellies! 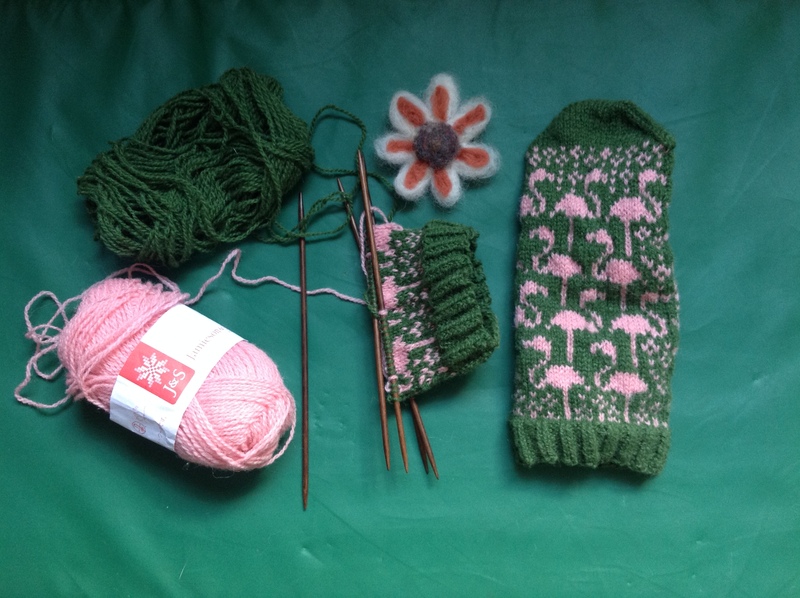 She wrote this post, about this Work In Progress she currently has on her needles… it looks beautiful. I am sorry to say, I have been having that same WIP hidden away in a bag for months now. Well the yoke on mine was going to be with paper dolls, like on the original pattern. But I have to unravel the whole thing, because it’s too tight. The sleeves are too tight. The whole thing is too tight. I knitted it all the way up to the yoke, and… no. I look like a fat sausage squeezed inside a road bike inner tube (please don’t analyse this). That’s how I started knitting socks after socks, after socks. 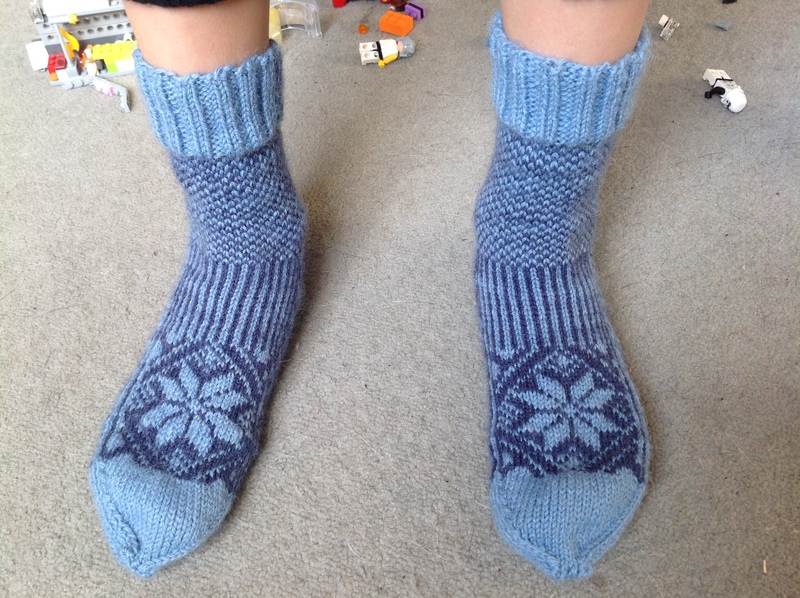 Well, knitting socks is nice and addictive. But I have also been subconsciously processing my failure, learning new knitting techniques and through knitting, knitting and knitting a bit more, just getting a bit better at it, one project at a time. And now, I am thinking that I could just unravel the whole thing, make it 2 sizes bigger (yes it’s that bad) and knit a yoke of paper owls instead of paper dolls! This idea rekindled some sense of hope and excitement with that project. Until now the thought of it just made me look up at my eyebrows and sigh. Although even when I finish a project, I pretty much always feel disappointed. It’s very odd. I can’t just enjoy the fact I have finished it, and that I have learned new things in the process of making it. No. I feel that somehow it’s not as good as what —- —— or ——– —- would have done, or that it doesn’t look as good on me as it does on the picture. I was very much made aware of that negative pattern when I finished my first flamingo mitten earlier this week. I felt deflated and considered giving up knitting altogether because I wasn’t good enough at it. And that’s a classic example of how people give up too easily on things. This lack of contentment, this tendency to not appreciate where I am, right now and to be pleased with the progress I have made will always get in the way! If I can’t look back and allow myself to be happy with the progress I have made (all through making mistakes, trials and a lot of errors) How will I ever be able to enjoy anything at all, let alone the way ahead? I think that’s the difference between most (sane?) people and the knitting goddesses I tend to compare myself with. If the knitting goddesses had been whining and complaining and self-loathing like me, they wouldn’t have been able to be where they are today. Well, I’m sure they too had their moments, but they had a vision and they just kept going “with confidence and hope, through all crises”. Contentment is the secret of happiness. No need to look anywhere else. We’ve got it all inside us already. We just can’t see it. if you want to be good at it.” – ahem, Me. The photo above is from the book: “Knitted Pirates, Princesses, Witches, Wizards and Fairies with outfits and accessories” by Annette Hefford. The journey is more important than the destination! Thank you very much :) I like your photographs! I like the way you capture the ambiances around you, they are very atmospheric! Don’t you stop taking pictures!! PS: you gave me the idea to do Christmas decorations with my pilling, Because I really loved your tea candle stars! You are very clever! I knit too but one simple jumper taken me over a year, just one more sleeve to go! I too love your little pilling flower and yes, the flamingos are exquisite! Thank you for sharing. This is why I love reading craft blogs and hanging out with crafty people… Because that’s when you learn that EVERYONE has the “I am terrible at this” day every once in a while. Since most of us do our making alone, it can be easy to compare ourselves unfavourably with those goddesses of knitting you talked about! But I picked up a great tip from a book called “Knitting in Plain English” – when you’re choosing a pattern, take a second look at how the model is standing in the photo on the front. For example, are they wearing a bag that means you can’t see the shoulder seam in any of the pictures? Do they always have their arms raised, or the sleeves rolled up? If so, chances are they’re trying to hide something that didn’t quite work out! So even the goddesses get it wrong sometimes 😀 Keep calm and carry on knitting… Oh, and felting! Your little fuzzball flower is a great idea! 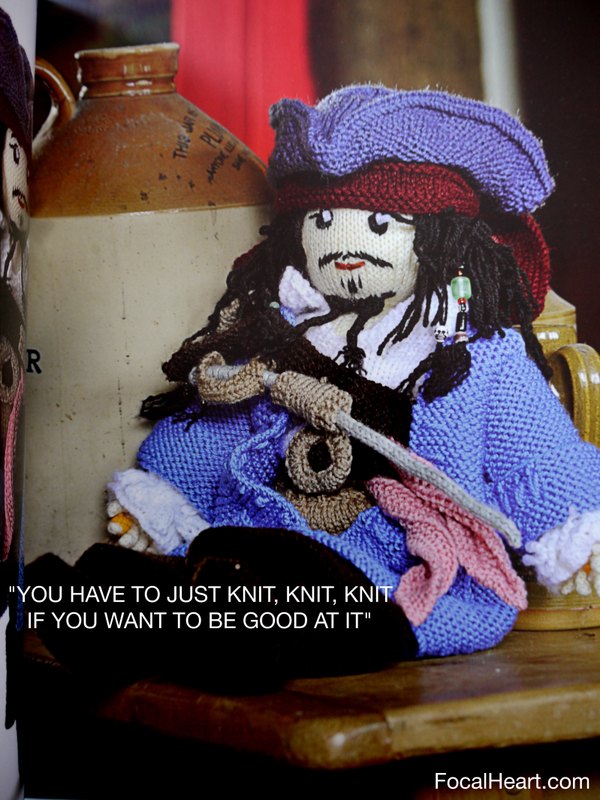 Thank you so much for your comment :) It’s very kind of you :) I know, knitting goddesses must have made tons of mistake to get there, and making mistakes is a big part of the learning process (for me anyway)… Thanks for reminding me! Yes, today I keep unraveling a babble hat, I’m trying to figure out when to start decreasing so it sits nicely on my head… Take 3! Hahaha! That’s why I rarely use them… Although making up patterns as you go along has its disadvantages too!